It is a big deal, this holiday season of Christmas. Even if you don't celebrate Christmas, it is impossible to avoid. There are advertisements, decorations, parties, sales, holiday themed clothing, more advertisements, cards, more parties, gifts and a few more advertisements. Sometimes there is so much going on, we forget that we are supposed to be enjoying ourselves. The end is in sight - it's the last week of the Christmas frenzy. Whether you love the holiday season or avoid it; whether you observe Christmas or not, when this week draws to a close it is our wish that everyone finds there is peace within themselves and the warmth that sharing time with those we love can bring. After all, there is little else in life that matters. This is an ORIGINAL DRAWING/PAINTING, (not a print) signed and dated in the back. More of My Fantasy Animals Drawings Series in Black 2008. I hope you like them too. 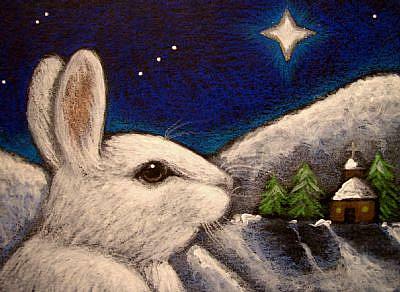 MY WHITE FANTASY HOLIDAY BUNNY RABBIT, WATCHING THE BELEN STAR. THE BUNNY WAS PAINTED WITH PENCILS, AND ALL DETAILS WITH ACRYLICS. ADDED GLITTER AROUND THE STAR, THAT YOU CAN'T SEE IN THE PICTURE. THE BELEN STAR IS VERY BIG NOW, MUST BE THE 24TH OF DECEMBER. I always look for details in my drawings, or paintings. The photo shown does not show exactly the real colors of an artwork. Colors may vary slightly due to the photographic process, and individual monitors. The colors you see on your monitor may not accurately reflect the actual colors. Each drawing is sprayed with Fixatif, to prevent smudging and wrinkling. Comes with a hard toploader envelope. Used Black Paper with Prismacolor Premier Colored Pencils & Acrylics.